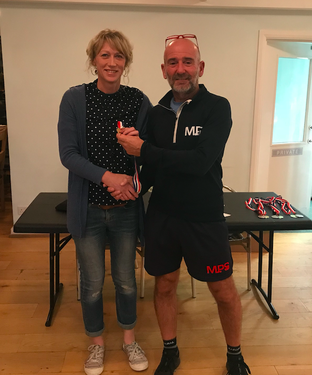 2019 will be the ninth time that Chichester Racquets and Fitness Club have hosted a HEAD UK-Racketball Series event making it the second oldest venue on the UK-Racketball tour. Last year The Chichester Racketball Open was one of the best attended in the country. The B Grade was a fantastic event with 22 players, Alex Glencross from Hallamshire made the final but was unable to prevent Chris O’Neil retaining the title that he first won in 2017. The Over 50’s was also a great draw with the final turning into a family affair between Dan and Matthew Fernandez. 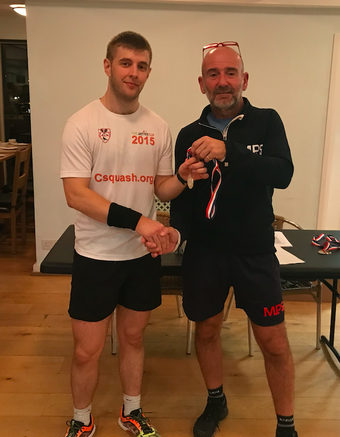 In the end Dan maintained his pattern of form at UK-Racketball events making the final but still unable to over come the final hurdle. ​To have a look at previous winners of the Chichester Racketball Open follow this link to our Hall of Fame page. If you scroll down you will be able to find the location pages at the bottom with the Chichester page at the top of this list! 2018 marked the seventh consecutive Chichester Racketball Open and this year we sold out in record time, a whole month before the competition! This is no surprise with such a fantastic facility and well run event by local Racketball legend Mike Phillips. The A Grade was the biggest draw in the Series so far in 2018 with 22 competitors split across 6 grades. Manuel Costa from Lisbon came through Group A without dropping a game. Alex Glencross upset the seeding’s in group B to claim his spot in the quarters. In Group C a fellow Hallamshire player Graeme Mason also made it through to the quarterfinals where he met John Waller from Dover. Chris O’Neil continued the run of form at Chichester which saw him become tournament champion in 2017 making it through Group E without dropping a game. Two seed Matt Morgan scrapped through two tough games in Group F to face O’Neil in the quarters. In the quarterfinals the lucky losers Lee Divers and Tom Ash did not have enough to make it past Manuel Costa and Alex Glencross. John Waller overcame Graeme Manson and Chris O’Neil defeated two seed Matt Morgan. Alex Glencross ended the Portuguese man’s run in the first of the semi finals. With Costa was also playing in the Over 50’s this was his eighth match of the day, a fantastic effort in itself. Chris O’Neil defeated John Waller from Dover in the opposite semi to claim his spot in the final for a second consecutive year. The final as in 2018 went the way of O’Neil. No player has ever won three titles at the same venue in three consecutive year’s on the UK-Racketball Series, it will be interesting to see if O’Neil can be the first in 2019! It was two late entries that stole the show in the Over 40’s. Adam Grilli made it through the challenge of Group A but was pushed all the way by top seed and England no.10 Spencer Harris. Phillip Hall had an even tougher time making it through Group B with both Paul Mcleod and Hallamshire’s Kevin Dudley forcing deciders. Grilli, Hall was a repeat of the Bexley final back in June but unfortunately for Grilli on this occasion it was Hall who came through triumphant with a 2-1 victory. ​Once again the Over 50’s was one of the biggest draws on the day. Four groups of four made it an even contest with not even top seed Dan Fernandez able to complain about having more matches than anyone else... Hunting down his first UK-Racketball Series title Fernandez made a good start defeating all three of his group opponents 2-0. Russell Cox came unstuck in Group B being defeated by Paul Buckner from Tonbridge 2-0. Group C saw top seed Andy Ruff scrape through 2-1 against first Paul Fennell and then Neil Widdison but he did not have enough to close out against England no.1 Michael Wardle who ended up claiming his place in the semi final. In Group D Matthew Fernandez progressed through to the semi defeating England no.8 Mark Banfield 2-0. The brothers Dan and Matthew Fernandez defeated Buckner and Wardle respectively to set up a family affair final. In the end Matthew came through triumphant defeating Dan 2-0. ​With the overall UK-Racketball Series championship at stake the tournament leader Stephen Widdison needed a win at Chichester to maintain his lead after Adam Grilli currently sitting in second became runner up in the Over 40’s. Widdison’s event started well coming through the group without dropping a game. Group B saw David Mudge fight his way past David Browne and Graham Banstead before a tough 2-1 against group runner up Alan Harris from Thanet. England no.2 David Worrall did not drop a game in Group C to claim his spot in the finals group. It was a three way competition in the finals group. Both Widdison and Worrall defeated Mudge 2-0 to set up another epic match between the two experienced and determined players. On this occasion the England no.2 had the better of the no.1 with the title going Worrall’s way 2-1. It was another fantastic Chichester Open. A big thank you to Mike Phillips for once again making everything happen. Hopefully we will be back in 2019 for what will be the ninth consecutive UK-Racketball Series event at Chichester. Only one event remains in the 2018 calendar the Series finals in Nottingham on the 8th of December. This is a double event with both a UK-Racketball Series singles event and the National Racketball/ Squash57 Doubles. Once again only 60 entrants per competition so enter now to avoid missing out.